It is called TUSAL, Totally Useless Stitch A Long and I discovered it while reading the blog It's Daffycat. When we talk about a SAL we always think in embroider something by objectives all at the same time. This SAL is completely different as we don’t need to do any embroidery. The idea of TUSAL is collecting in a jar all the the cast-off thread ends a needleworker cuts away. These ends are called ORT ~ Capitalized, it stands for Old Ratty Threads. These ends are often saved in clear jars as a decorative object. Every New Moon day we need to write a post in our blogs with the picture of the jar. Why New Moon day? Because DaffyCat, the person who organizes the SAL, decided in that way. 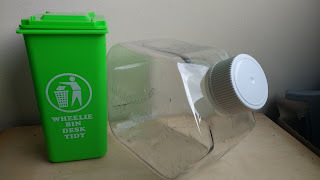 I normally put all my threads ends in a green bin which I have only for that purpose and I empty it once or twice a year when it is full. The idea of collecting all the ends in a jar and share with people looked interesting and funny to me and I decided to join. You can introduce whatever you want, fabric trimmings, thread bands, empty spools or any other stitching cast-offs you gather. I decided to add only the cast-off threads. 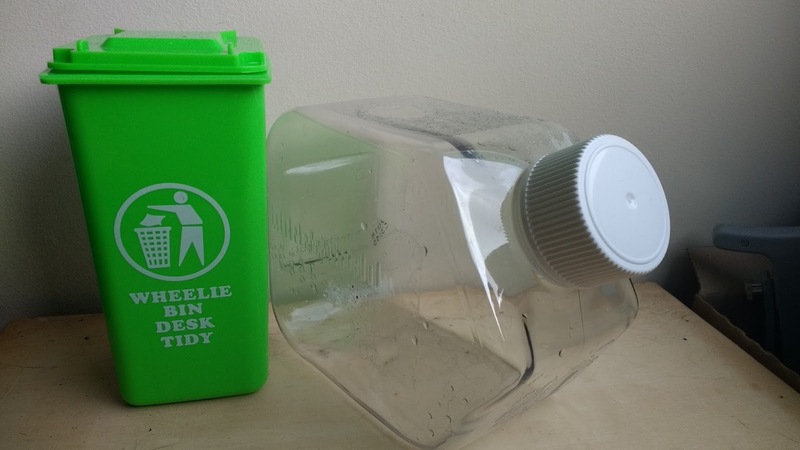 The following picture shows my green bin on the left and the jar I am going to use for that project on the right. If you want to join, visit It's DaffyCat blog.